This technique produces beautiful backgrounds and is so easy to do! I won’t go on about the technique, Jennifer McGuire does such a beautiful job of this, so just click on the blog post link I mention above. I used several die from SSS to create this card. The background was created using their Maple Leaf Corner die. I angled this die several different ways across the shimmer cardstock to create the inlay pattern. There were some spots that couldn’t be filled in because of the size and angle of the corner die. For these spots, I used the individual Stitched Maple Trio Dies to fill in what spaces I could. The dies from the trio set coordinate with the Maple Leaf Corner die. I cut 2 large maples leaves using the Stitched Grand Maple die from vellum to make a sturdy platform for my sentiment. I heat emboss my sentiment with copper embossing powder on one of the large maple leaves. I added bronze sequins to this leaf, attaching them with glue dots. I added glue dots to the back of the leaf underneath the sequins and adhered the second maple leaf to it. More glue dots were then added to the back of the double-layered vellum leaf to adhere them to the card front. The inlay front was cut down to 4 inches by 5.25 inches and mounted with white fun foam and then adhered to a top-folding A2 portrait-oriented card base. I was very pleased with the results. The card has a very elegant feel to it and it was a fairly easy technique to use. Thanks Jennifer for showing us this technique! Hope you all have many, many beautiful reasons to be happy! SSS Maple Leaf Corner Die; SSS Stitched Maple Trio Dies; SSS Stitched Grand Maple Die. Neenah Solar White 80# for the front card panel, Gold Shimmer cardstock from Paper Source? ; Neenah Solar White 110# for the card base; Bazzill 40# Vellum for sentiment base. Hero Arts embossing powder in Copper; Pretty Pink Posh 6mm flat sequins in Bronze. This month’s Mix It Up Challenge on the Ellen Hutson Classroom blog requires the use of any creative combination of Essentials by Ellen and Concord & 9th stamps. 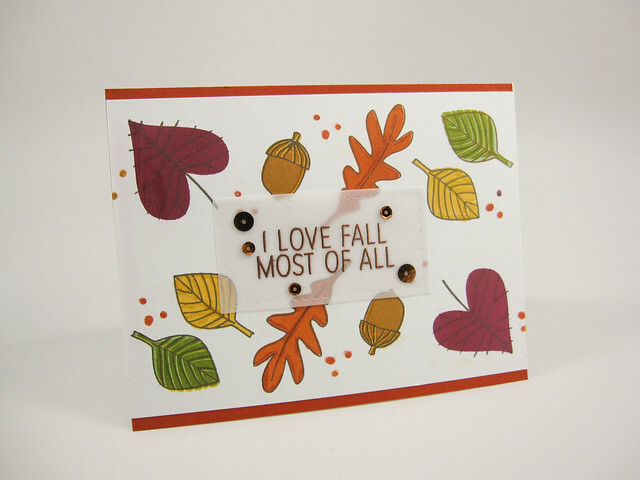 I chose to create a card with warm autumnal colors to welcome the Fall season. The leaves used in this card feature leaves from Essentials by Ellen’s Autumn Acorns and Concord & 9th’s Give Thanks stamp sets. The sentiment is from the Give Thanks set. I used my MISTI stamping tool to help me stamp the leaves to ensure that I got good impressions of the solid leaf images as well as their outline images. I love the line images from both sets and you could make tons of different cards with these sets. The sentiment piece was die cut from vellum using a stitched die. It was stamped with Versamark ink and then heat embossed using Copper embossing powder. I cut down the original card front by 1/8 of an inch on the top and bottom so that the final length was 4 inches by 5.5 inches across. The card panel was mounted on rust-colored A2 card mat and then the entire front was mounted on a top-folding, landscape oriented A2 card. Hope you enjoy the fall colors as much as I do. WPlus9 – Gift Card Layers Die (stitched rectangle from this set). Hero Arts Mid-Tone Shadow Inks in Raspberry Jam, Just Rust, Butter Bar and Cup O’ Joe (outline for the leaves) ; Hero Arts Bold Inks in Caramel, Tangerine and Moss; Versmark Ink. Neenah Solar White 80# for the front card panel, Papertrey Ink: Terracotta Tile as mat for the card panel; Neenah Solar White 110# for the card base; Bazzill 40# Vellum for stitched-rectangular sentiment. Hero Arts embossing powder in Copper; Pretty Pink Posh 6mm flat sequins in Bronze and 4mm cupped sequins in Bronze.